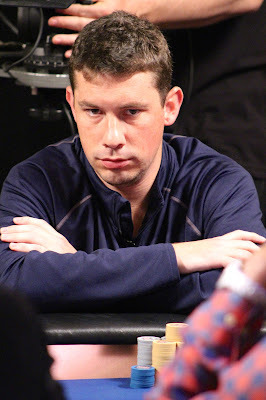 After coming back substantially from a very short stack, Casey Carroll got all the chips in preflop again, and once again, it was Rob Wazwaz who had him at risk. Matt Culp raised to 200,000 on the button, Carroll raised to 625,000 in the small blind, and Wazwaz four-bet to 1,400,000 in the big blind. Culp folded, Carroll went all in for 3,200,000, and Wazwaz called. Carroll had Wazwaz in bad shape and the flop came , giving both players a pair of aces but Carroll with the best kicker. The turn was the , changing nothing, but the dramatic fell on the river, giving Wazwaz two pair to win the hand. Carroll, who won this event exactly one year ago, ran deep here once again, but fell just short of the repeat victory. His family and friends here rooting him on are surely proud of his performance here again.